Controlling when the UAC box appears is easy, just move the slider in the Control Panel. The hard part is truly understanding the ramifications of this feature so that you can make an informed decision. You can turn off the Windows 8 UAC by visiting the Control Panel and navigating to the User Accounts and Family Safety section. 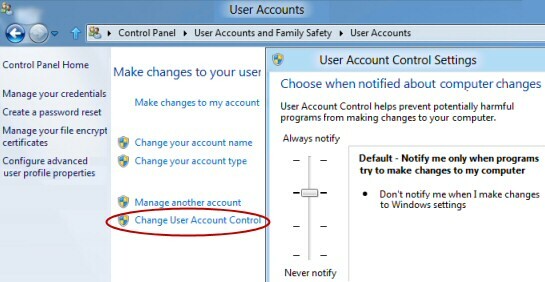 Click on User Accounts, select the link under: ‘Change User Account Control Settings’, see screenshot below. Note: One surprise – at least to me, was that changing the UAC setting in this way affects all users who logon to your Windows 8 machine. – I make changes to Windows settings. Notify me only when programs try to make changes to my computer. Never notify me when programs try to install software or make changes to my computer. Pedants will point out there is a 3rd setting, but I have never seen anyone use it! The only difference from number 2, is that with number 3 the UAC is enabled, but does NOT dim the desktop. Microsoft’s goal for the UAC is to persuade techies to logon with a humble account with limited privileges, and then to avoid having to logoff/logon by providing the UAC for when they need to install a program or change an operating system setting. Sensible people, those who always choose best practice, logon with a standard account and accept the default UAC behaviour. Gung-ho types, who always logon as an administrator, will recklessly change the UAC to ‘Never notify’, thereby removing the last line of defence against a rogue program trying to install itself. Techies like me, who use an account with administrative privileges yet keep the default UAC setting, find that in practice the dialog box is more of an occasional reminder than a constant pain. My conclusion is that there is a trend for techies to ‘go with the flow’ and accept the UAC shield, even with the default, nagging settings. It seems to be ordinary users with pre-conceived ideas, or bad experience with Vista, that are the ones who want to turn off the UAC in Windows 8. As for me, I always like to glance at the name of the program which generates the UAC, just to be sure its not malware. See more on Understanding the UAC. By using gpedit.msc once again you can set the UAC for all users. As you search for gpedit, remember that .msc extension otherwise it’s difficult to locate this Local Group Policy Editor. ‘Elevate without prompting’ disables the UAC. Elevate without prompting: Permits administrator accounts to configure any setting without the UAC appearing. Prompt for credentials on the secure desktop: The current account is prompted for an administrator’s name and password, the operation continues with the user’s highest available privilege. Prompt for consent on the secure desktop: When you ask the operating system to perform a security sensitive it asks you to Permit or Deny. The key point is that it tries to continues with the your highest available privilege, which is fine if you are an administrator. Prompt for consent for non-Windows binaries: (Default) When you are configuring a third-party application, if it needs elevation of privilege, you either Permit or Deny. See another group policy example: how to disable Windows 8 USB. Set the value of EnableLUA to 0. See screenshot below. Note 1: Changing EnableLUA is one of those settings where you need to reboot the computer before it takes effect. Note 2: To enable the Windows 8 UAC, set EnablueLUA to 1. Note 3: If you like this registry hack, then click on regedit’s Favorites menu, and Add to favorites’. This saves time if you ever have to return to this place in the registry. I was pleased to find that the old MSConfig was still alive and well in Windows 8. 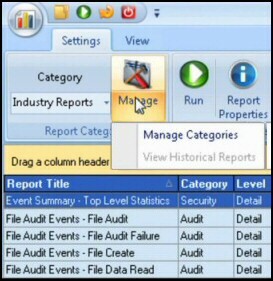 The idea is that you can select the ‘Tools’ menu and ‘Change User Account Control settings’. See screenshot below. Note 4: What I ask you to observe with this method is the name of the executable :- UserAccountControlSettings.exe, because it corresponds to the above setting in the Control Panel. Note 5: A point to contemplate is that this setting is bound to affect all users of the Windows 8 computer. 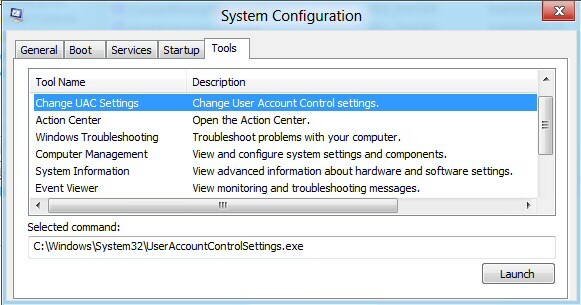 "User Account Control (UAC) is a feature in Windows 8 that can help you stay in control of your computer by informing you when a program makes a change that requires administrator-level permission. UAC works by adjusting the permission level of your user account. If you’re doing tasks that can be done as a standard user, such as reading e‑mail, listening to music, or creating documents, you have the permissions of a standard user – even if you’re logged on as an administrator. When changes are going to be made to your computer that require administrator-level permission, UAC notifies you. If you are an administrator, you can click Yes to continue. If you are not an administrator, someone with an administrator account on the computer will have to enter their password for you to continue. If you give permission, you are temporarily given the rights of an administrator to complete the task and then your permissions are returned back to that of a standard user. This makes it so that even if you’re using an administrator account, changes cannot be made to your computer without you knowing about it, which can help prevent malicious software (malware) and spyware from being installed on or making changes to your computer." See more about Microsoft and Disabling the UAC. 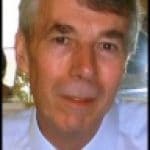 Adjusting the computer’s clock is an interesting case study for using the UAC. Changing the time is a security issue and by default will the require the UAC. However, changing the time-zone does not compromise any of the operating system’s audit time-stamps, consequently the UAC is not needed. Windows 8 also allows standard users to view the firewall settings and use Windows Update to install optional updates and drivers. They can also adjust the display DPI, and refresh the IP address with needing administrative privileges and hence attracting the UAC dialog box. In Windows 8 the User Account Control dialog box is much less ‘in your face’ than Vista or even Windows 7. Microsoft has re-thought when it’s desirable for the UAC to leap into action and inform us of a significant change to the operating system settings. Furthermore, if you disagree with Microsoft’s default settings it’s much easier to make the UAC even less intrusive.